Stay in the Game! Don't let Arthritis Pain Bench You! Forty three million people in the United States alone, suffer from arthritis. This degenerative disease can be debilitating and can lead to other serious conditions like heart disease, diabetes and hip fractures. For those dealing with the pain, it is a constant struggle. Arthritis and back pain are the second most common reason for visiting a doctor, after colds and flus. It impairs daily activity, sometimes to the extent that the individual becomes depressed and can negatively impact relationships. Many people believe that once they have it there's no turning back, it's part of the aging process and a down hill slide. They may also believe that the best way to relieve the pain is through rest. Both of these ideas are far from the truth and myths that need to be busted! New research is finding that arthritis can be reversed and that pain does not have to be a part of your daily life. Through a combination of nutrition, complementary therapies and exercise you can live well in spite of arthritis. The most important part of controlling or reversing arthritis is through nutritional therapy. This will have the most profound affect on joint health and is the easiest to implement. It involves not just the food you eat but also the specific nutrients that nourish your joints. There's a bonus to this therapy too! Not only will you reverse arthritis but you will also lower your risk of developing dementia, heart disease, diabetes and some cancers. You can't beat that! So where do you begin? Water makes up 75 percent of muscle and more than 20 percent of bone. Our entire body is 2/3 water. Not only does water help carry nutrients and oxygen to your joints it also moisturizes and give support as well. If you don't get enough water on a daily basis, you can eat all the right foods, take all the right medication and supplements, but you'll be wasting your money because your joints can be stiff and sore if you are dehydrated. Start your anti-arthritis life plan by making a commitment to drink at least 8 glasses of water a day. Fruits and vegetables contain substantial amounts of vitamin C, carotenes, folate, and a number of different minerals. These are the nutrients that people with arthritis need. People with certain types of arthritis seem to use up vitamin C faster than other people so it is important to ensure an adequate intake of fruit. Beta-carotene seems to help reduce the risk of disease progression with osteoarthritis. Not getting enough from your diet or not absorbing nutrients from the foods you eat can lead to deficiencies of nutrients important for joint health. Keeps fruits to a minimum as they are high in fructose any kind of sweets can promote inflammation. The protein requirements for those dealing with rheumatoid arthritis are higher because they experience an increase in protein breakdown, which leads to loss of muscle. The right kind of protein is essential for building collagen, an important structural component of cartilage. Cold water fish are rich sources of EPA and DHA, two very effective omega-3 fatty acids that fight the inflammatory process of arthritis. Grass fed meats also contain fair amounts of these necessary nutrients. Vegetable proteins from tofu, beans, nuts and seeds are plant sources of protein but are not good sources of omega-3 fatty acids. Grains should be consumed with caution. The quality and type of grain is paramount. Whole grains provide the body with key nutrients like B vitamins, vitamin E, zinc, iron, selenium and magnesium. However, if you are sensitive to certain grains (such as the ones with gluten) you could be doing more harm than good. Find out if you have a sensitivity through Electrodermal testing. Acupuncture-a recognized treatment that stimulates the flow of Chi. In Chinese medicine it is believed that energy flows along meridians. Along these meridians are points that when stimulated can either increase or decrease the flow of energy to that part of the body. Arthritis, in Chinese medicine, is an obstructive condition. To correct this imbalance acupunture points are stimulated by inserting small needles and vibrating them. 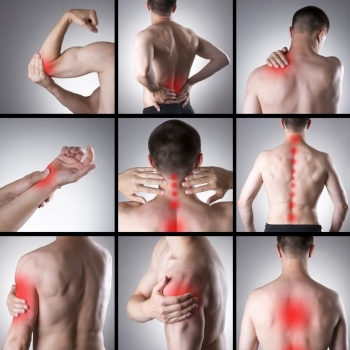 This form of treatment has been shown to lessen inflammation and pain. Glucosamine and Chondroitin-Both of these compounds are part of the cartilage found in joints. In a normal, healthy joint the production of the components of cartilage are in balance. In the arthritic joint this balance is off, causing more destruction than production. By taking glucosamine and chondroitin the metabolism in the joint is affected positively, increasing the building of cartilage and decreasing the destruction. They may also have some anti-inflammatory benefits as well. Infrared Sauna-I swear by mine! BioFlex Low Intensity Laser-This technology uses specific wavelengths of light that allow photon energy to penetrate the tissues. This energy interacts at the cellular level to restore normal cell function as well as enhancing the natural healing process. This non-invasive, non-toxic and easily applied therapy has no known side effects, yet can produce dramatic results. Some of the conditions it helps are: fibromyalgia, headaches and migraines, bulging and herniated discs, osteoarthritis, spinal stenosis, rheumatoid arthritis, plantar fasciitis, burns, etc. When you are in pain and find it difficult to move, exercise may seem a bit daunting. It can be a challenge to get your body moving, especially if you have little energy as well as pain. However, exercise is not just for those who are already fit, nor does it have to be overly strenuous. Exercise can be a gradual progression you guage by how you feel. It can be mild, incremental and done in the comfort and privacy of your own home. Or you can get out playing a sport, like Pickleball, and get some great social interaction as well! Builds muscle which helps with weight loss and blood sugar balancing. Improves mood and helps relieve depression. Improves balance so can help prevent falls. Improves flexibility so can help prevent falls and injury. Reduces the risk of osteoporosis. Reduces the risk of many types of cancer. Reduces the risk of diabetes and cardiovascular disease. Exercise can also help improve energy, vitality, sexual function and libido. That's a lot of benefits! All it takes is a 30 minute walk every day. If you aren't walking at all then start with 5 minutes every other day, build up slowly as your tolerance and fitness improves. Add weight training with soup cans or dumb bells three times a week and resistance training with Therabands twice a week. Remember, slow and steady is best, not diving in feet first! If you don't want to do it alone, ask a friend to join you and hire a Personal Trainer to set you both up with a program. As your fitness improves you will find yourself able and willing to do more. Arthritis does not have to change your life. You don't have to expect gradual decline and degeneration. You can make the choice to embark on a program that will change your life. You have the power. Just think, you can have pain free days, restful sleep, more mobility and the knowledge that you took control of your health. Can you beat that? copyright @ 2007 Meza Health Systems, Inc.